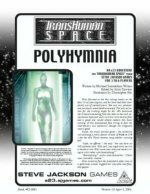 At the dawn of the 22nd century, Polyhymnia is the coolest nightclub anywhere. In a world where entertainment fads rise and fall so fast that you can't even call them Flavors of the Month anymore, Polyhymnia has been around for more than a decade. It's never in the same place – or even the same experience – twice, thanks to the brilliance of Julian Cressida, one of the greatest memeticists ever. But somebody has learned a devastating 15-year-old secret about Julian Cressida, and they need an independent group to get to the bottom of things . 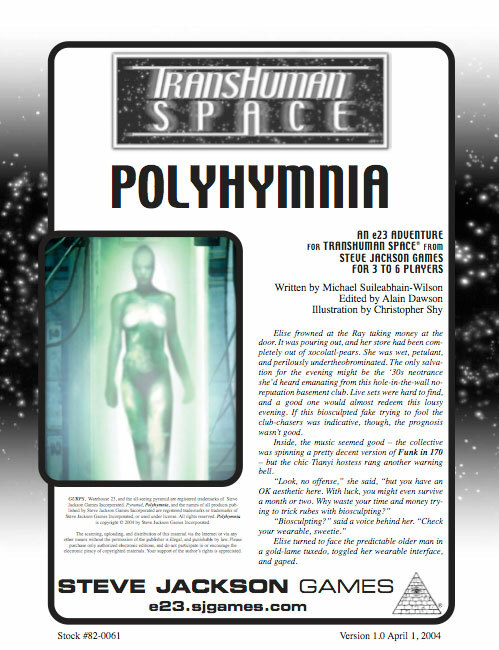 . . before Polyhymnia's true purpose is revealed. Transhuman Space: Singapore Sling – In this adventure, the players must dig through a mountain of disinformation to find out which of Singapore's elite is ready to sell out his country to the Transpacific Socialist Alliance. Transhuman Space: Toxic Memes – In a world where belief, fear, and ideology can be sculpted like clay, how does anyone know what they really think? GURPS Bio-Tech – Say goodbye to your old body. Have you upgraded your genetics this year?